That's odd, it is building raw2dng.exe. As I recall that doesn't build properly with a 64-bit compiler. I can't reproduce the error because my PC is a very slow and old 32-bit laptop. Here are some things you can try. If neither of these works you can delete your 64-bit Cygwin installation and install a 32-bit version in its place. Please post which "fix" worked for you. Without quotes, -lgcc in the search string means "return pages that do not contain lgcc". Thank you for reply dfort and alex. dfort, i have tried your fixes, but it does not work. No raw2dng.exe, no raw_rec.mo. May be i have to install cygwin32. Now commented # all:: raw2dng in modules/raw_rec and raw_rec.mo appeared! ...What if you have a 64-bit system? Please leave feedback if you get mingw64-x86-64-gcc-core working and on which command line tools--it is going to need some tweaks to the ML source code. That might be a little confusing but basically it means that if you are going to compile the command line tools, like raw2dng.exe, it has been tested to work with the 32-bit compiler (i686) but not with the 64-bit compiler (x64). I wasn't aware that building a platform automatically builds raw2dng but now that I see that does. It was the same with cr2hdr until just recently with this commit. The other popular command line tool, mlv_dump, isn't built when a platform is compiled so I thought that was preferred method. Build rules for raw2dng are in both raw_rec and lv_rec so perhaps we should look into that. Simply adding the "-std=c99" switch worked for me but it should be tested on other 64-bit systems. I'm a bit confused with that comment. So commenting out the "all" rule worked for you? This should build the raw_rec module but not raw2dng.exe. What was it that didn't work, adding the "-std=c99" switch? @alex - Which compiler are you using on Linux and are you cross compiling Windows binaries? Would adding the "-std=c99" switch to the raw2dng make rules have any negative consequences? It seems to work fine with the Windows binaries that I have compiled on my Mac. So commenting out the "all" rule worked for you? This should build the raw_rec module but not raw2dng.exe. If add "-std=c99" switch, raw_rec module is not built. @alex - Which compiler are you using on Linux and are you cross compiling Windows binaries? The one from Makefile. The nightly build server compiles cr2hdr.exe and mlv_dump.exe, but raw2dng binaries weren't updated lately (maybe I should set up a job for it as well). Would adding the "-std=c99" switch to the raw2dng make rules have any negative consequences? BTW, gcc 5.x uses -std=gnu11 by default, whereas gcc 4.x uses -std=gnu89. Ok--looks like @vstrglv is able to compile ML so I'll test some Makefile changes that should keep these issues from coming up again. Thank you. Now this error has gone. I'm at a loss to figure out what is going on here and how to fix it. Just before deleting my previous Cygwin installation I downloaded the latest ML and compiled just fine. Of course I no longer have the previous installation--ugh! For what it is worth turning off the module configuration allows compilation to complete but of course no modules are built. Best guess: I'm using a trick to strip most TCC symbols - everything but the API we use - in tcc/Makefile near localsyms. This file should contain all TCC's symbols except those listed in the error message. Some of the tools used to create this file might not be available on Windows. I'm guessing that between September 2015 when I wrote this tutorial and March 2017 when this issue was reported something changed in Cygwin. Maybe one of the tools used in tcc/Makefile? Long shot, grep was updated to 3.0. [EDIT] It looks like the "symbols"command is missing in Cygwin while OSX has it. I never heard of that command. #warning FIXME: why does it overflow without this extra RAM when loading the big adtg_gui? Here are my results of those commands. The output should contain all other symbols, except tcc_new. I can see those tcc_* appearing in the Cygwin tcc/localsyms but are not in the Mac tcc/localsyms. So I take it that might be the problem? By the way running "make clean" will not remove the localsyms file though that probably isn't an issue. The results of readelf ... grep commands were the same on both Mac and Cygwin? As a workaround, you can manually delete these symbols from "localsyms", then run "make" again. The localsyms file will not be re-created (unless you also edit some TCC sources), but libtccx.o (which is the one used by ML) will be re-created using your modified localsyms. I didn't run the readelf ... grep commands on the Mac. All I did was compare the two localsyms files. Found the problem and a solution! Here's what users following this tutorial should do until grep is fixed in Cygwin. 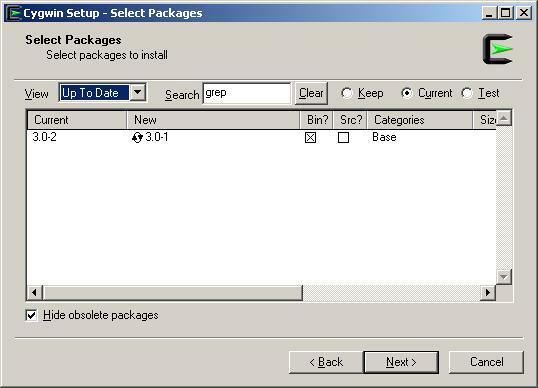 Re-run the installer, choose the "Up To Date" view option, search for "grep" then click on the circle with the arrows where it says "Keep" until you find the previous version of grep. Cygwin setup will replace grep and it should work. You might have to delete tcc/localsyms file. Note that after you successfully build ML at least once you can go back to that buggy version of grep and you'll be able to continue building ML because the localsyms file doesn't get overwritten with each build or even by running "make clean" this may or may not be a good thing. It drove me nuts while trying to get this Cygwin tutorial working again. Resolution - downgrade to grep-3.0-1. resolution was to downgrade grep to the previous version. and the changes between text and binary mounts. and what is the error ? >> used in a Makefile. > and the changes between text and binary mounts. > and what is the error ? only matching \n instead of \r\n. > Most likely, $(READELF) is producing \r\n-terminated output. binutils version, it should NOT be outputting \r\n in the first place. >> Most likely, $(READELF) is producing \r\n-terminated output. > binutils version, it should NOT be outputting \r\n in the first place. > programs into the pipeline. and just to prove this detects "\r"
so culprit must be native Mingw binutils readelf. I need to make sure this is working on previous versions of grep and other platforms but it looks like it is a rather benign change. [EDIT] This issue should only affect the Windows platform and is caused by the Windows line endings created by the pre-compiled ARM toolchain. Mixing non-Cygwin packages in a Cygwin environment is not recommended but the only other option is to build the ARM toolchain from scratch--unless the Linux binary works in the Cygwin environment? Never mind, that didn't work. So it looks like some of these issues are Déjà vu. As far as the best way to "fix" the issue of mixing a Windows native ARM toolchain in a Cygwin environment--I've been trying to compile the ARM toolchain in Cygwin but haven't quite got it yet. The easier method would be to just deal with the Windows line endings in the Makefile in a way that doesn't affect other platforms which is something that we already have figured out. Finally, suggestions for how to improve one line of code keeps coming. This one is from Brian Inglis on the Cygwin mailing list. (some of which could also be saved by a single egrep (grep -E) using "|"
so I don't see a valid reason for optimizing it (it's only called once in the build process). Made a pull request that will fix the Cygwin grep 3.0 issue with precompiled Windows ARM toolchain. Also added some other tweaks to the tcc Makefile. Tested on Cygwin and Mac development environments.